I have been practising Dayan Qigong大雁氣功 for over 35 years. My teacher, Grandmaster Yang Mei Jun楊梅君, was a small lady, less than 5 feet tall and not over 90 pounds in weight. When she was in her 90s people would carry her as it was quicker when travelling around as a group. One day one of the big students offered to carry her on his back. She smiled and said to him, “You think you can pick me up?” Of course the big student thought it was not a problem, and so he answered, “Yes.” However, when he tried to pick up my teacher he found she was very, very heavy and he could not move her! He tried a few times to pick her up and after a while gave up. Finally my teacher Yang Mei Jun said, “Ok, I’ll let you carry me now!” This time when the big student tried he found she was light and he could easily pick her up. This surprised him and all of the other students around as well. My teacher Yang Mei Jun used the skill a Thousand Gin Sinking千斤墜. 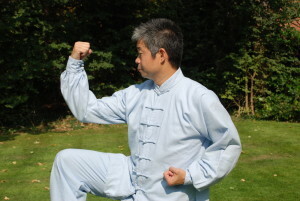 This skill is developed in many styles of martial arts training and is Neigong 內功 which is also Qigong氣功.